However, if is entirely possible that if you drag a clip into this bin that you may get the following ‘Change Settings’ message. What this means is that the project you have created has different default settings to the actual footage you wish to use in your project. 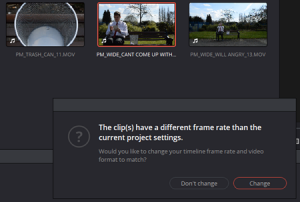 So, if the majority of the footage you want to use is the same as the first clips you drag down then go ahead and change. 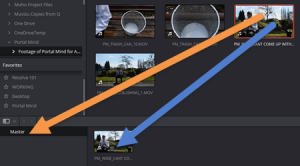 However, you will only get this option once per project – so either change your project setting before you import any clips or make sure the first clip you add is from your primary camera. 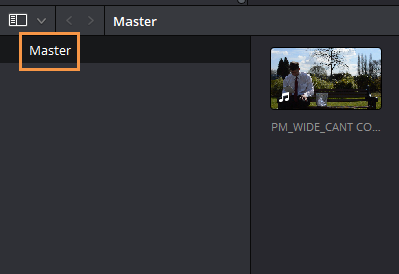 To change you project settings, make sure you do this before you import any clips. Choose File>Project Settings, or Shift + 9 or click on the little cog icon at the bottom right of the UI to get the following large dialogue box. 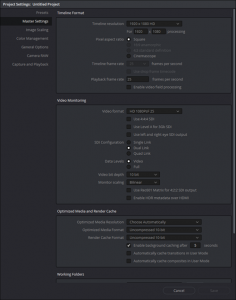 The part you need to change before adding media is the ‘Timeline frame rate’. 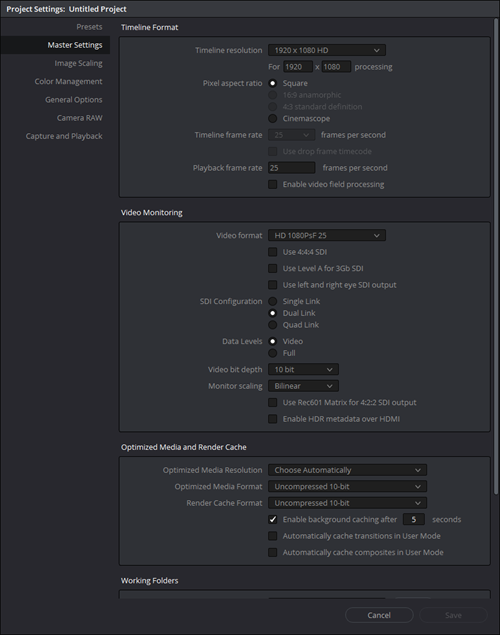 In the picture below this is greyed out as I have already added the footage and click to change settings which has set the frame rate to match my footage at 25 fps (frames per second). If you choose to do this before adding media, change the frame rate to match your footage, hit ‘Save’ and then start importing your footage. 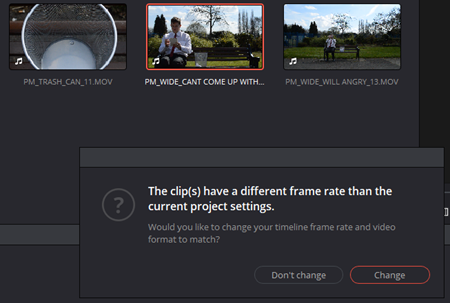 If you have done it correctly, you shouldn’t get any dialogues coming up when you first import a clip. 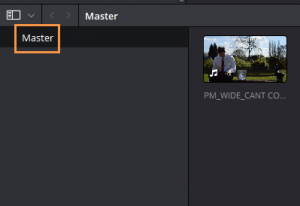 While dragging clips into your project may seem a good way of doing it, it is very inefficient, especially if you have already organised your footage into various folders on your system prior to working in Resolve. If this is the case, then try right-clicking on your folders in the media browser and look at the various options there. The three options highlighted are common choices. 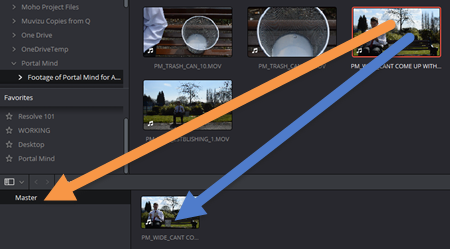 The first option will only add media if it is in the folder that is being right-clicked. 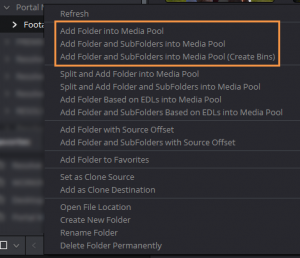 The second option will add all media from that folder and from any nested folders directly into the Master bin. 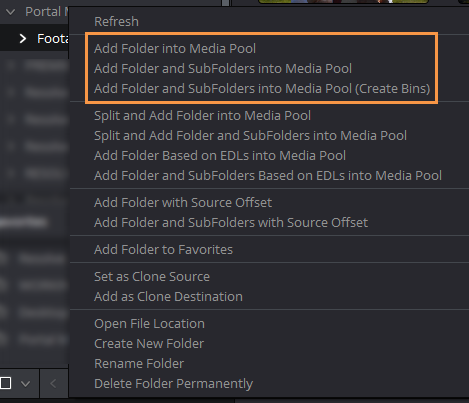 The third option is an interesting one as it will not only add all the footage from the folder and any nested folders but it will also create folders (bins) which are nested into the Master bin that match the same structure of your original folder – which is great for organisation.